Lawrence Brownlee (born 1972) is an American operatic tenor particularly associated with the bel canto repertoire. Describing his voice, Speight Jenkins, general director of the Seattle Opera, said: "There are other singers that sing this repertory very well, but I don't think anyone else has quite as beautiful a sound and as rounded a tone," and praise his "incredible top notes", adding about his high F (F5) in "Credeasi, misera": "With him it's not a scream, it's a beautiful sound." Mezzo-soprano Joyce DiDonato adds: "He is always in service of the music. His natural instrument is just incredibly beautiful. The word 'honey' comes to mind. He also has technical prowess and agility." Brownlee was born in Youngstown, Ohio. He grew up without much exposure to classical music, but had an extremely musical childhood, playing trumpet, guitar and drums, and singing Gospel music in church. His first gigs were at an amusement park in Sandusky, Ohio, singing pop and show tunes. Brownlee attended Anderson University in Indiana for his undergraduate degree and Indiana University Jacobs School of Music for graduate studies. He studied with soprano Costanza Cuccaro, David Starkey, and Fritz Robertson. While a graduate student, he became a member of Kappa Alpha Psi fraternity, his desire to become a member was due in large part to his association with members of its Alpha chapter, founded at Indiana University Bloomington in January 1911. He was officially initiated into the Indianapolis Alumni Chapter in the fall of 1999, but considers himself close to the founding chapter and was involved in many of its activities while a student. He became a life member in 2008. 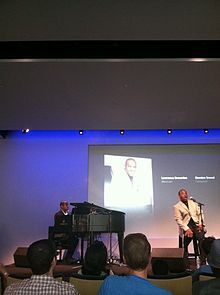 Brownlee participated in young artist programs at the Seattle Opera and the Wolf Trap Opera Company. Brownlee's professional stage debut took place in 2002 as Almaviva in Rossini's The Barber of Seville with Virginia Opera. Brownlee made his Metropolitan Opera debut in a new production of Il Barbiere di Siviglia in 2007. The role has since become one of his most recognizable and famous. He has subsequently appeared in Il Barbiere in Vienna, Milan, Berlin, Madrid, Dresden, Munich, Baden-Baden, Hamburg, Tokyo, New York, Washington, San Diego, Seattle, and Boston. Brownlee's career highlights include performances of The Barber of Seville at the Vienna State Opera, the Boston Lyric Opera and Madrid's Teatro Real. He has appeared in Rossini's L'italiana in Algeri and La Cenerentola at Milan's La Scala, as Belfiore in Rossini's Il viaggio a Reims in Brussels, and as Tonio in Donizetti's La fille du régiment at the Cincinnati Opera. He has also received acclaim in Rossini's Armida, alongside Renée Fleming, in the famously challenging role of Tonio in La fille du régiment, and as Arturo in I puritani at the Metropolitan Opera. In 2014 Brownlee, Juan Diego Flórez, and Javier Camarena were called "The Three Tenors," and said to "represent a new golden age in high male voices and in the singular thrill of their top notes." In concert, Brownlee has performed in Handel's Messiah with the Houston Symphony and the San Francisco Symphony. He has given recitals under the auspices of the Marilyn Horne Foundation, and was featured in one of that Foundation's Gala Concerts at Lincoln Center. In May 2010, Brownlee performed a concert with mezzo-soprano Denyce Graves in the United States Supreme Court Building for the Supreme Court justices. He also gives recitals with selections from his Spiritual Sketches album with Damien Sneed, new arrangements of traditional music, including for an NPR "Tiny Desk Concert". In a departure from his usual repertoire, he created the role of Syme in Lorin Maazel's opera 1984 in its world premiere at London's Royal Opera House on May 3, 2005. In 2015 he will play Charlie Parker in the premiere of Daniel Schnyder's opera Yardbird at Opera Philadelphia. Brownlee lives in Atlanta with his wife, Kendra, and their two children. He is a fan of the Pittsburgh Steelers. He also likes photography and playing table tennis, and is an avid salsa dancer. He sang the national anthem at Heinz Field on November 15, 2015 when the Steelers played the Cleveland Browns. Winner of the 2001 Metropolitan Opera National Council Auditions. Seattle Opera's Artist of the Year in 2008 for his performances as Arturo in Bellini's I puritani. ^ Woolfe, Zachary (4 May 2014). "Three Stars Who Navigate on High C's". The New York Times. Retrieved 7 August 2014. ^ Tommasini, Anthony (18 April 2014). "Allowing a Puritan to Marry for Love". The New York Times. Retrieved 7 August 2014. ^ Woolfe, Zachary (4 May 2014). "Three Stars Who Navigate on High C's". The New York Times. Retrieved 8 August 2014. ^ "Lawrence Brownlee: Tiny Desk Concert". NPR. Retrieved 8 August 2014. ^ Midgette, Anne (14 May 2014). "Lawrence Brownlee offers arc of self-revelation in Vocal Arts DC recital". The Washington Post. Retrieved 7 August 2014. ^ "Charlie Parker's "Yardbird"". Opera Philadelphia. Retrieved 7 August 2014. This page is based on the Wikipedia article Lawrence Brownlee; it is used under the Creative Commons Attribution-ShareAlike 3.0 Unported License (CC-BY-SA). You may redistribute it, verbatim or modified, providing that you comply with the terms of the CC-BY-SA.